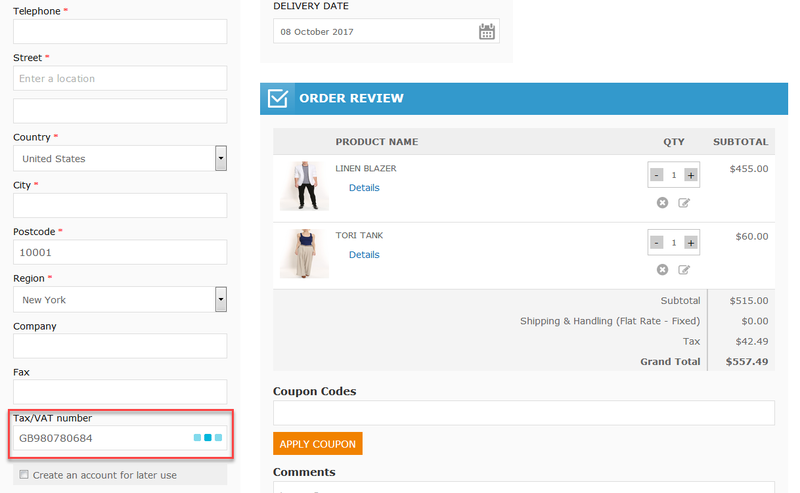 All checkout steps like shipping address, billing address, shipping method, payment method etc appear simultaneously on a single page. 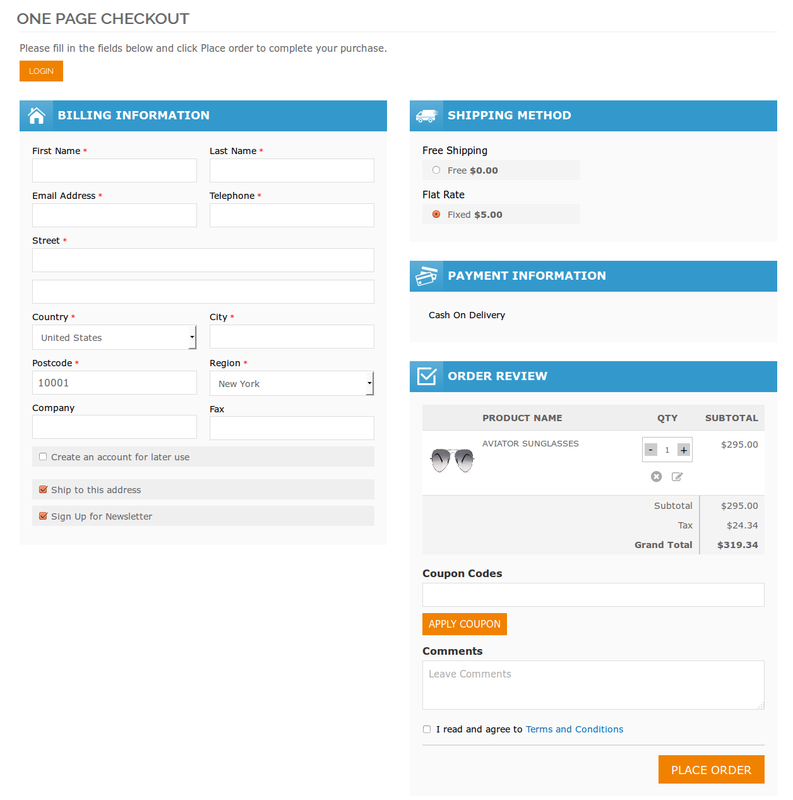 Fully Responsive One Page Checkout to increase conversion rate and sales for your store. 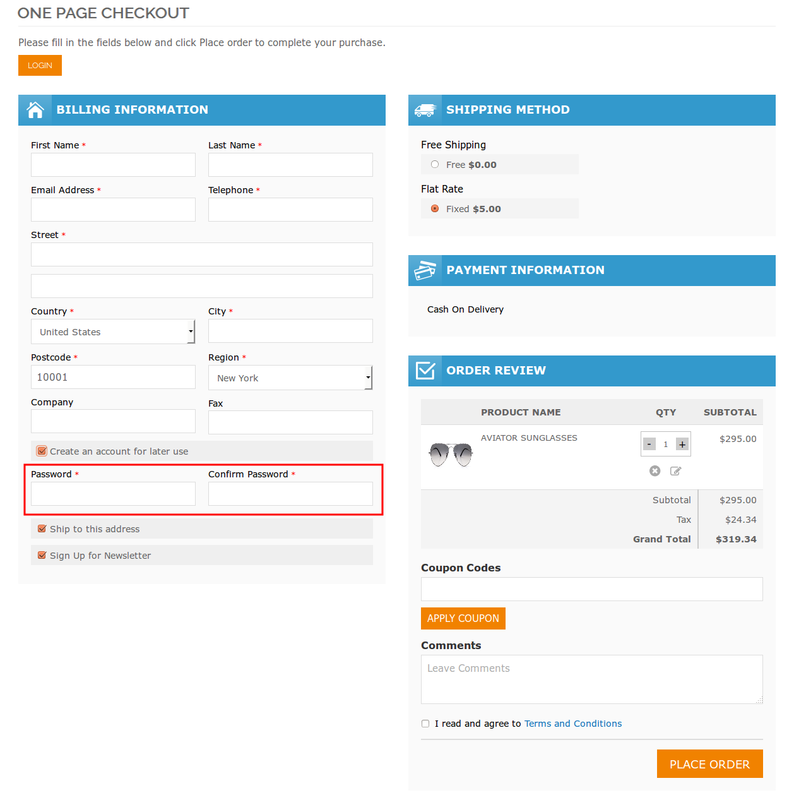 Give configuration for Redirect customers to checkout automatically after adding products to cart. 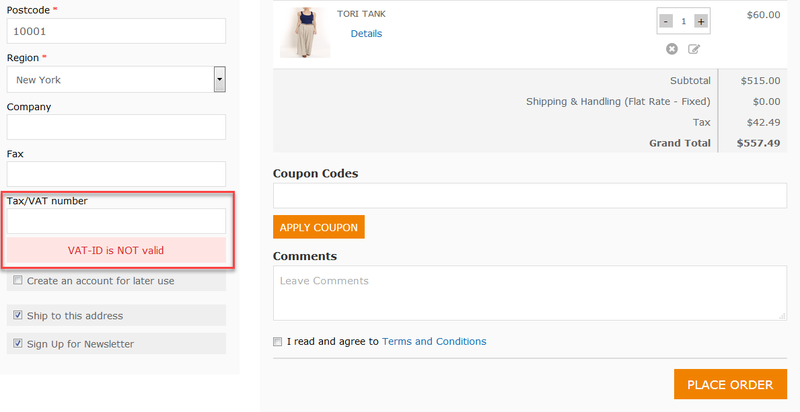 Allow customers to remove product, edit Qty from checkout. You can Change checkout title and description from configuration. Modify title as well as button background and font color as per your site theme requirement. Set up checkout page layout as 2 columns or 3 columns. The extension is a very reliable for simplifying the entire checkout process. After installing the Magento extension, your customers won’t find any difficult in finishing the checkout steps and placing orders for their favorite products. 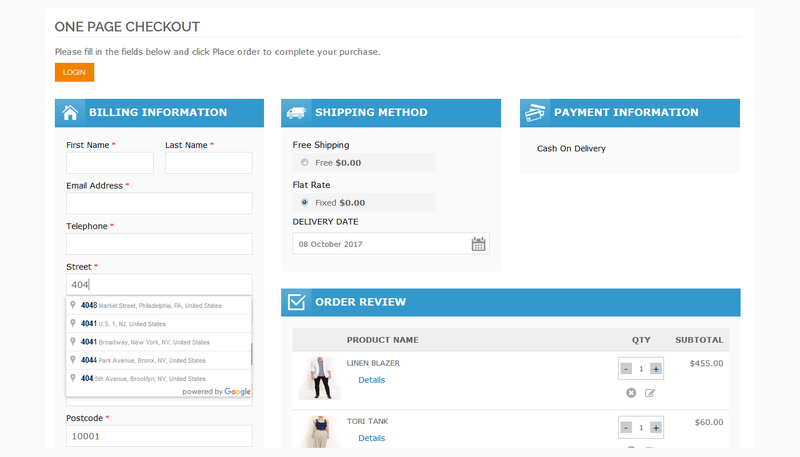 The module displays checkout information including: billing address, shipping address, shipping method, payment method, etc. together in one page for customer’s ease. The extension has the potential to boost sales by 30%. It is known to optimize checkout process and reduce cart abandonment rate. If you are looking for ways to increase business and convince customers to shop more, this is the extension for you! Support all the checkout modes like register, guest, logged in customers. 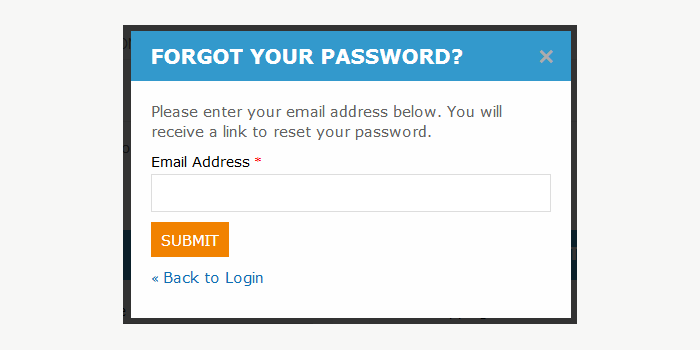 Pop up for login/forgot password. 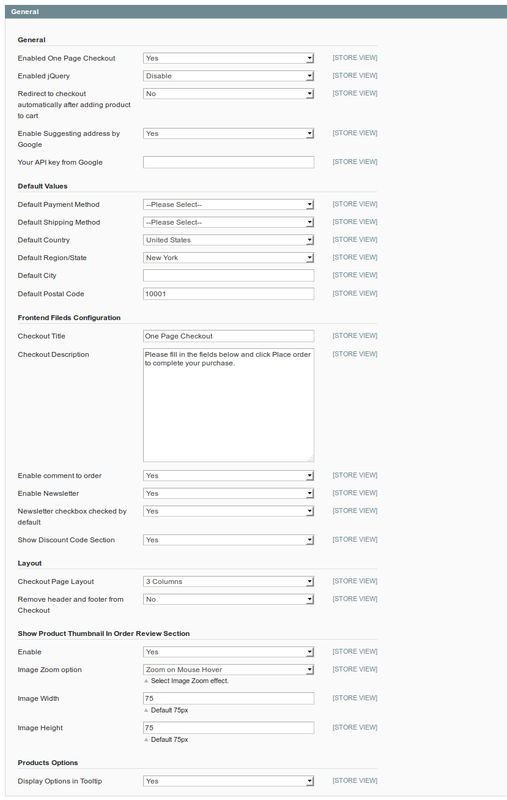 Allow setting different Checkout page layouts for different store views. Support most popular magento default as well as external payment methods like PayPal, SagePay, Authorize.net etc. You can set default shipping method & payment method. 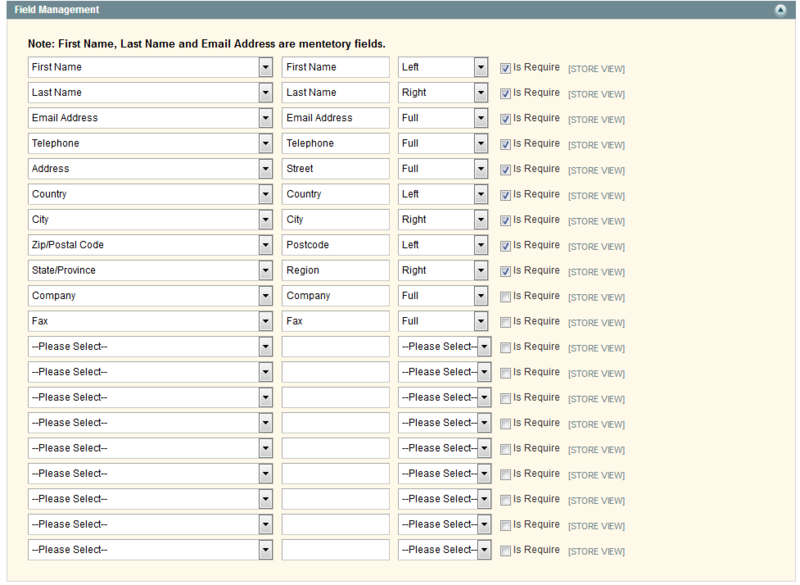 You can manage field’s labels, Positions, make it required or not in billing address from configurations. Customers can see the product images displaying in the Order Review section at checkout page. Choose to sign up for newsletters. 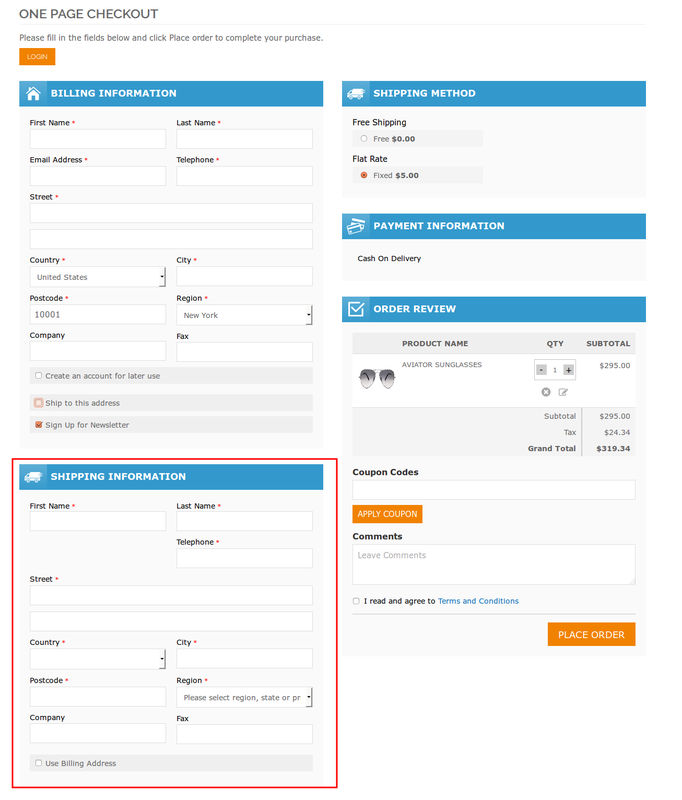 Admin is able to set checkbox for newsletter subscription checked by default. Admin can manage Terms and Condition section and its content. Admin can enable/disable the header & footer on the Checkout Page. 1. Login: Customer can login or reset its password from here. When customer click on login button then login form will be open in popup windows. 2. Billing Information: In this section all the billing information like first name, last name, email address, address, country etc. Customer can fill all the details easily from here. 3. Create an account for later use: If any guest customer wants to register in store directly from checkout page then he/she can do it using this option. Customer just needs to define his password. 4. Ship to this address: Customer can select different shipping address and billing address. By default both the addresses are same but customer can change it using this option. 5. Sign up for Newsletter: We provided option for display newsletter section in checkout. So customer can subscribe in your store directly from checkout. It will increase number of subscriptions in your store. 6. Shipping Method: All the enabled and associated with billing/shipping address shipping methods will be display in this section. Shipping method section will be updated automatically based on billing/shipping address information. 7. Payment Information: All the payment methods will be display here. It will also auto updated based on billing/shipping address same as shipping method. 8. Order Review: In default Magento customer can see limited information in order summary section. We extended order review section for better customer experience. Here we provide configuration for show/hide product images as well as set its size manually as per your requirement. Customer can update qty directly from this section as well as remove product. Shipping and Payment information section are updated automatically based on any modification in review section. 9. 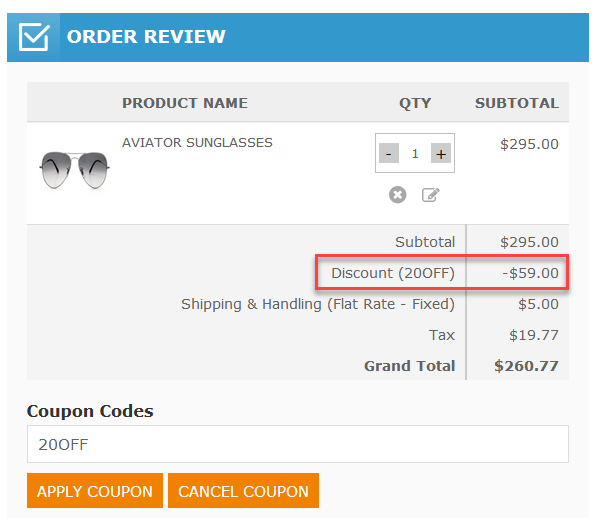 Coupon Code: We provided ability to show/hide coupon code section in checkout page. Customer can apply any coupon code directly from checkout page. He doesn’t need to go cart page again and apply the coupon code. It will increase the user experience. 10. Comments: Customer comment is very useful for store admin because of that we provide show/hide order comment section in our extension. Customer can write any comment in this section. 11. 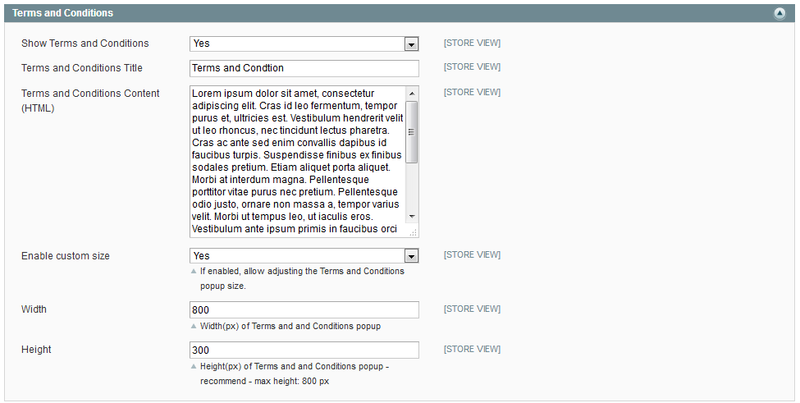 Terms and Conditions: Admin can manage his store terms and conditions easily using this section. All the terms and conditions will be display in popup. Admin can manage its size from configuration as well. 12. 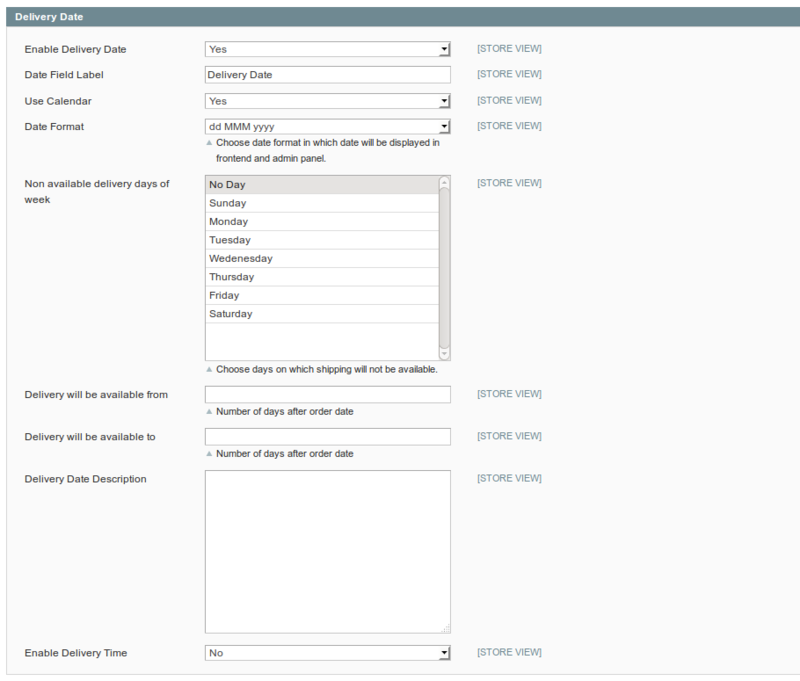 Delivery Date and Time: Admin can enabled/disabled delivery date and time functionality. It will help customer to select specific delivery date for get the products. 13. TAX/VAT Number Validation: We provide feature for enable/disable Tax/Vat number validation. It will check TAX/VAT number is proper or not which is provided by customer and give appropriate message for that. 14. 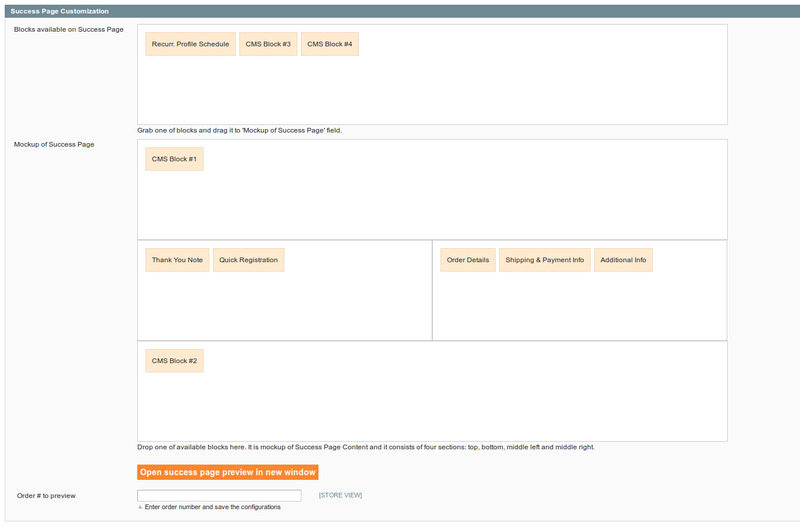 Success Page: Now admin can customize the order success page more attractive and more informative. In success page customer can see all the details as well as additional details. 15. Auto Address Suggesting by Google: In our extension we provide google auto address suggestion feature. Admin can easily enable/disable this feature from admin configurations. This feature allows customer to write their address easily and save their time. Enabled jQuery: Enable/Disable jQuery. This option is useful when there are more than one jQuery library included in your site. 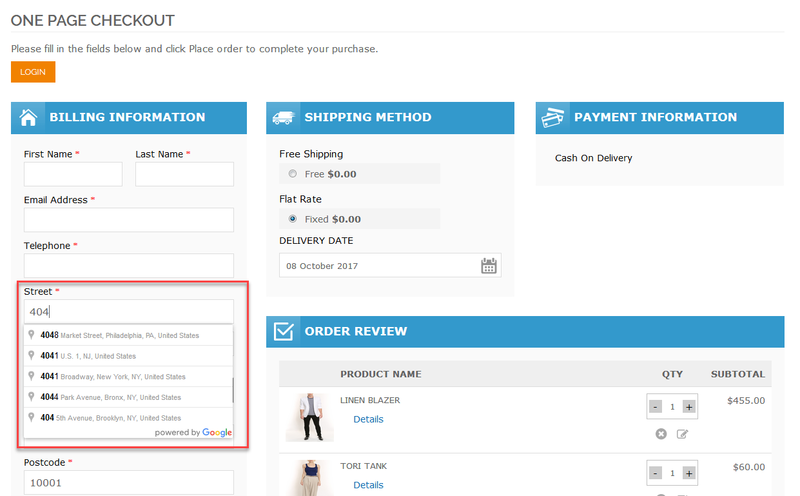 Redirect to checkout automatically after adding product to cart: When this option is enable then customer will redirect to checkout instead of cart page while add product to cart. Your API Key From Google: Add your Google API Key here. Default Payment Method: For set default Payment Method in frontend. Default Shipping Method: For set default Shipping Method in frontend. Default Country: For set default Country in frontend. Default Region/State: For set default Region/State in frontend. Default City: For set default City in frontend. Default Postal Code: For set default Postal Code in frontend. Checkout Title: For set checkout title which will display top of the page. Checkout Description: For set Checkout Description. Newsletter checkbox checked by default: For set newsletter checkbox value by default. 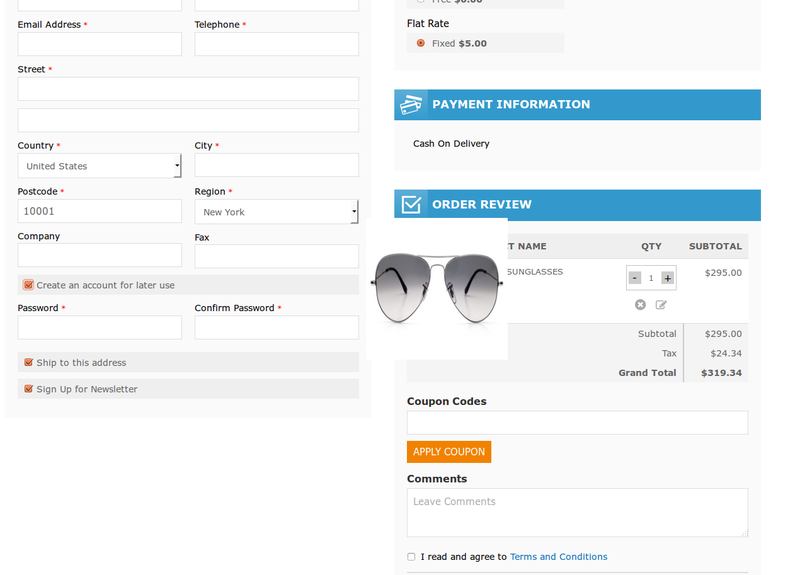 Checkout Page Layout: Set checkout page layout. There are two options available. 2 Columns and 3 Columns. Remove header and footer from Checkout: Show/Hide site header and Footer section in checkout page. Show Product Thumbnail In Order Review Section–Enable: Enable/Disable Product image thumbnail in order review section. Image Width: Set Product thumbnail image width. Image Height: Set Product thumbnail image height. Display Options in Tooltip: Enable/Disable display products option value in tooltip. In this section you can arrange field positions, set field require or not as well as change field label as per your requirements. Enable Delivery Date: Enable/Disabled Delivery Date Functionality. Date Field Label: Delivery/Date Label. Use Calendar: Enabled disabled calendar for select delivery date. Date Format: For set format of delivery date. 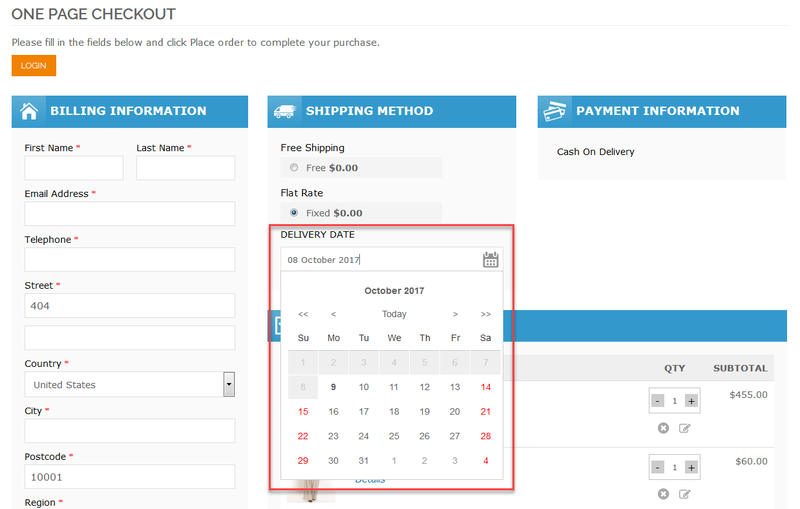 Non available delivery days of week: Here you can select on which day you cannot deliver the products. Delivery will be available from: Delivery will be available from place the order. Delivery Date Description: For add delivery date description. Enable Delivery Time: Enable/Disable Delivery Time. Select Time Format: For set format of delivery time. From here you can customize success page. You can select different sections for display it in success page with different position. You just need to drag the block from "Blocks available on Success Page" to "Mockup of Success Page" section for display it. Enable Registration: Enable/Disable Registration in checkout. Enable custom size: Enable/Disable Terms and Condition popup custom size. 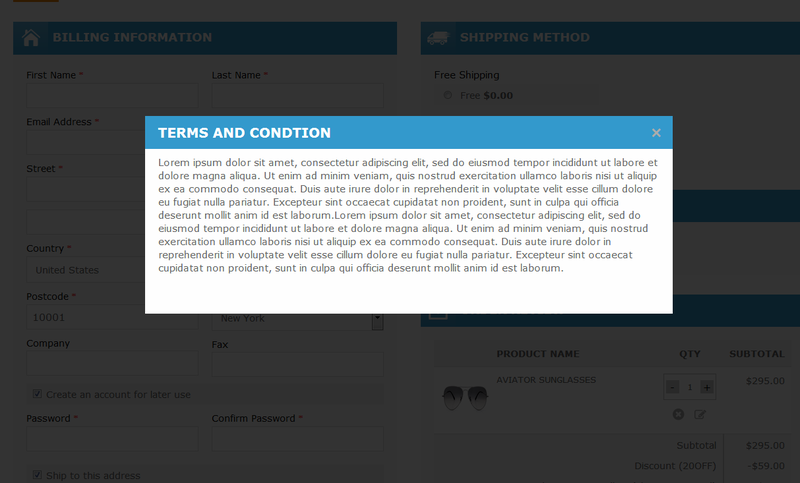 Width: Terms and Condition popup custom width. Height: Terms and Condition popup custom height. Step Background Color: Choose steps (Billing Address, Shipping Address, Shipping Method etc) background color. Button Background Color: Choose buttons (Place Order) background color. Title Font Color: Choose steps (Billing Address, Shipping Address, Shipping Method etc) font color. Button Font Color: Choose buttons (Place Order) font color. I have always trusted MageBees for buying quality Magento extensions. And, this extension doesn't let me down. 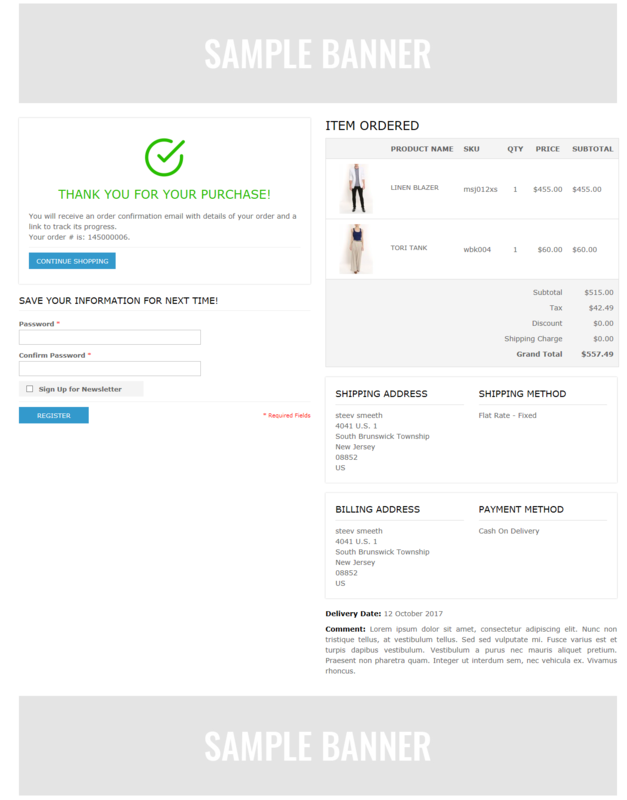 The one-page checkout module works perfectly fine for Magento 1 stores. Customers can finish the entire shopping process in just one page. So, quick and easy. Worth the investment. One Page Checkout Extension delivers! After analyzing the reason behind low sales, we came to the conclusion that customers abandoned carts due to long checkout process. They had to fill all the information even if they had accounts with our website. We needed to change it. And that's how this extension came into picture. 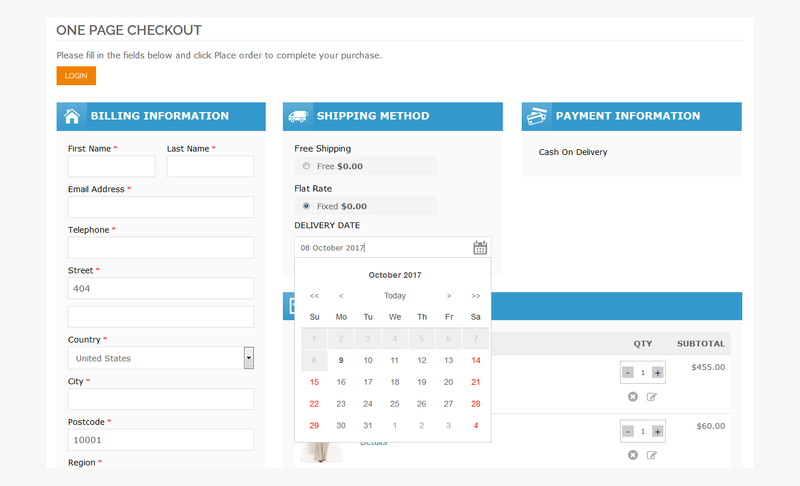 Very useful Magento module that provides all the checkout steps in one single page. Customers can edit any information they like without losing the cart. Also, auto-filling addresses meant less work for customers and more business for us. I used Magento one page checkout extension to streamline the checkout process. Without the unnecessary steps, customers can now finish the shopping process quickly. They can edit quantities in one window and do not need to go back to make changes. Saves time! The need of every Magento store! One Page Checkout is the need of every business. If you have an online store and your checkout process is lengthy, it just means terrible for your business. Shorten the process with this amazing extension from MageBees. I have seen increase in sales, you will too. I used one page checkout extension in my store because I got so many abandonment cart products. After using this extension I can see its really reduce the rate of abandonment cart. I must say its work as per their description. Thank you for such a nice extension. Added Gift Option Section same as default checkout. Fixed Shipping and Payment Method refresh issue. Fixed zero Price Product Shipping Rate issue. Q-1: I have installed One Page Checkout Extension. But When I try to access configuration page then I am getting 404 page not found error. Ans: After installing One Page Checkout Extension. 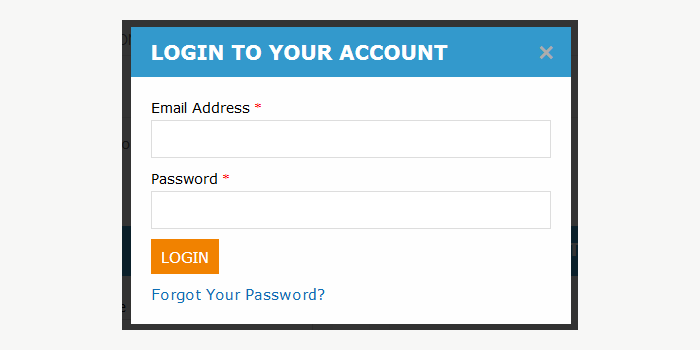 Please Logout from admin account and Re-login and Refresh Cache. Q-2: I am getting jQuery not found error in frontend. Ans: For resolve this issue you have to enable jQuery library option from configuration if jQuery library not added in your store.